Magda Michielsens (1944) was professor of Women's Studies at the University of Antwerp (Belgium) till the end of 2007. She was director of the Women's Studies program and of the Center for Women's Studies at the University of Antwerp. Her courses: 'women in philosophy' and 'gender and media'. From 1980 till 2001 she also lectured Women's Studies at the University of Nijmegen in The Netherlands (now Radboud Universiteit). The last 12 years of her appointement in Nijmegen she worked at the Institute for Gender Studies. 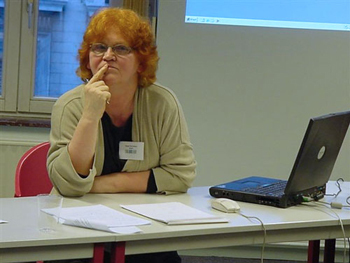 She was member of the council of AOIFE (the European academic network of women's studies institutions) and active partner in Athena (the European thematic network of women's and gender studies). She holds a PhD in Ethics (moraalwetenschap) of the University of Ghent (Belgium). She obtained her PhD in 1973, and worked at her home university from 1969 till 1977.